Amnesty International is a worldwide movement of people campaigning to protect human rights, with a vision of a world in which every person enjoys all of the rights stated in the Universal Declaration of Human Rights and other international human rights standards. As online activism can harness thousands of people behind a cause in just minutes, the web is a fundamental platform for human rights causes. Amnesty International Australia (AIA) identified the need for a strategic review of their online environment. From this review, AIA selected global digital agency, Reactive, to conduct a comprehensive website refocus. 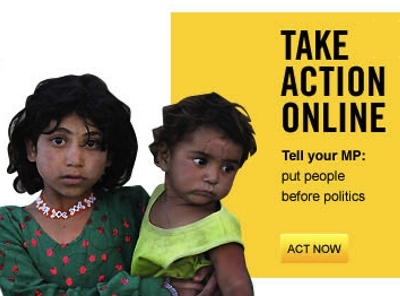 AIA needed to encourage actions for campaigns, so petition groups and fundraising groups could rally together to pressure governments and expose abuse of human rights, quickly and with maximum exposure and effect online. Reactive was tasked with defining a digital solution for key changes required for the site to deliver key performance indicators for AIA. The website refocus needed to take the current static information rich website and transform it into a place where activity occurred – where user groups could conduct actions and participate in a variety of activist causes through the interface. The site needed to be a useful tool for committed and passionate participants to broadcast their thoughts and feelings both within the website and beyond it to the social web where causal messages would be disseminated broadly. In addition, the new website needed to drive additional supporter sign up by directing different user groups to add their details to the Amnesty database for ongoing email communications. After conducting an in-depth research and discovery phase to determine key aspects of the site that needed to change, Reactive proposed a digital strategy that brought user interfaces to the surface. The strategy was to showcase the vibrant online community of like-minded individuals, and to promote activity both on the site, and through the social media sharing capability. “We wanted to leverage the social web to mobilise activists, reach more people and boost our campaigning impact,” said AIA’s online manager, Seb Cumberbirch. Reactive mapped out recommendations that were prioritised into ‘must have’ and ‘nice to have’ categories for a staged rollout. Internal workshops uncovered primary personas and scenarios for the various user groups as well as identifying the core drivers that encouraged online actions. Reactive embraced a strategy of clear messaging, easy to use activation tools, and clearly defined outcomes to each action, keeping the multiple user groups in mind. The refocused website strategy facilitated participant sign up for like-minded individuals to collectively gather and demonstrate in a fast and cohesive way. The project took about a year to complete from brief to launch. Reactive prepared wireframes and visual design for key screens to be redeveloped. The wireframes were submitted for an expert review by external usability consultants to further refine Reactive’s solution. 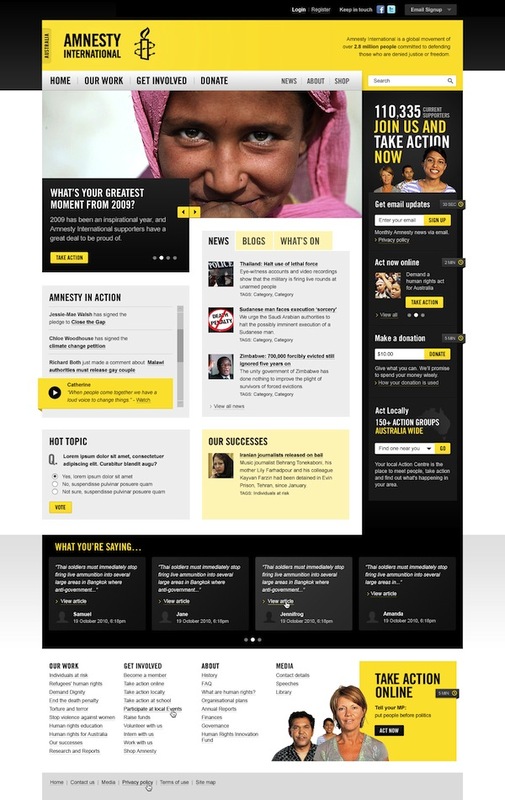 As the refocus project was not a complete website redesign, the Reactive development team worked closely with the Amnesty web team to ensure the solution would be easy to implement for the internal team. improved visual design with better use of graphics, icons and imagery. The AIA website refocus project has been a resounding success with all KPI’s met. The new site receives regular positive feedback from users and AIA, and was delivered on time and within budget. The strong results include strong increases across the board, with lifted site traffic by 35%, improvement in unsolicited donations of 32%, and 89% more comments on the website. The site needed to broadcast thoughts and feelings of multiple user groups both within the website and beyond it to the social web where causal messages would be disseminated broadly. Social media tools built into the new site delivered strong results with a 36% increase in the number of Facebook fans and a 300% increase in Twitter followers. In addition, the new website drove 35% more new email sign-ups.